The regal red-headed woodpecker is easily identified by its burgundy red head and bold black and white plumage. This medium sized woodpecker is a year-round resident of this area. They are very territorial and may reuse the same nest cavity for many years. Red-headed woodpeckers are the only woodpecker that stores food. They store live grasshoppers as well as nuts such as acorns, beach nuts, and pecans. They also occasionally eat mice. At Wild Bird & Garden we have a great selection of food and suet that Red-headed woodpeckers love such as the Woodpecker Blend seed with dried fruit, insect and peanut suet cakes. 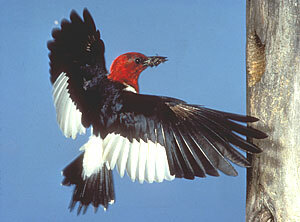 Red-headed woodpeckers prefer open woodland habitat such as pine savannahs, swamps, and wetlands with dead snag trees. They nest in dead trees. The male may excavate the nest cavity or they may use natural cavities. The red-headed woodpecker is listed as near-threatened by the International Union for the Conservation of Nature (IUCN). Populations are in decline due to habitat loss and the loss of nut-bearing trees.